Back in the Standard season with the original Ravnica block and Kamigawa, it was possible to make a pretty nasty discard-themed Orzhov deck. Hypnotic Specter was part of Standard, and there were two different creatures with comes-into-play discard effects in Ravenous Rats and Shrieking Grotesque. 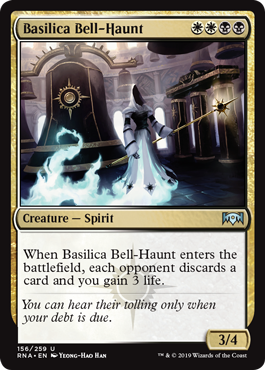 Basilica Bell-Haunt is usually an upgrade on either of those, provided you’re in Orzhov colors, although the higher mana cost can make it a little awkward on the curve in constructed. It still has potential – it’s evasive, it’s hard to kill with damage, and it doubles down on advantageous effects – but it does have a lot of competition at its cost. I like the idea of pairing it with cards like Confessor in multiplayer settings, too. One of the draft-oriented mega-cycles in the two newest Ravnica sets is a group of four-mana uncommons that cost four colored mana. For Orzhov, four mana gets them a 3/4 that gives them three life and strips a card from their opponents’ hands. This isn’t an amazing rate of return on-paper (arguably the weakest of the five from Ravnica Allegiance), but it plays pretty well in practice. Four toughness matches well against any number of early creatures outside of Gruul (who wants to only smash), but being able to stabilize with some extra life and potentially rip away an answer to the Bell-Haunt is a pretty good place to be. I don’t see a place for it in Standard, but it should help you through many a draft game on its own.